This crochet coffee cozy makes a perfect handmade gift! What a fun way to wrap up a gift card! I love these little things and find them so useful! 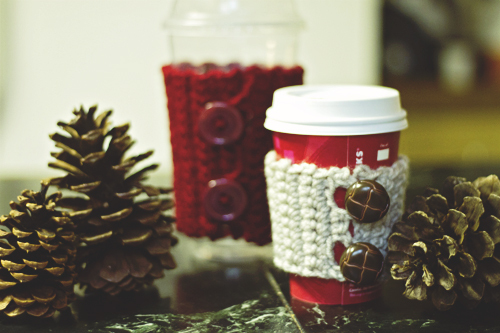 Make a easy crochet pouch for make up or other essential or even a crochet snowman ornament! You are going to love this darling crochet coffee cozy with button. 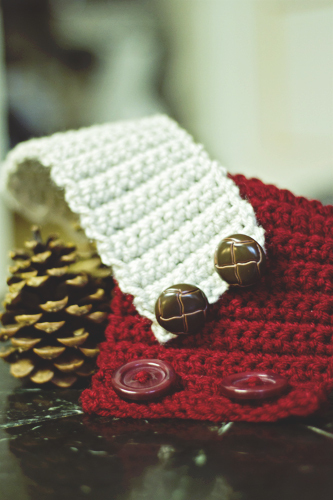 This quick and easy free crochet pattern will make a useful handmade gift that is sure to be loved. Hello everyone! This is Sara from Confessions of an Ex-Ballerina, and I would like to share a fun holiday crochet pattern with you that comes straight from the rainy Northwest. If there is one thing we know here in Cascadia, its coffee. The warmth, the smell, the smooth goodness of roasted coffee beans in the morning. There is only one thing that puts a damper on my experience… That darn cardboard cover that’s tacky beyond belief. If only there was something else that was warm and comfy to make my day… Oh wait, there is. Try this easy coffee cup cozy and recycle that cardboard instead. Your favorite color of yarn. Needle for darning in the ends. 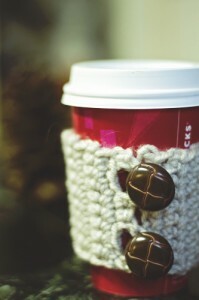 This pattern is for a tall coffee, but you can add two extra stitches to the chain for grande and four for vente. Repeat from * for 8 inches. On last row, SC in first 2 stitches. Chain 4. Skip 2 stitches and SC in next 2 stitches. Chain 4. Skip 2 stitches and SC in last 2 stitches. Fasten off. Darn in ends, sew on buttons and get yourself a nice hot cup of coffee. My name is Sara, without an H because its cooler, and I wear my sassy pants most days. I live in the beautiful great Northwest with my husband and three crazy boys. 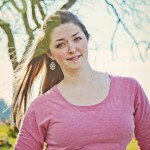 I own my own Photography business and I blog at least once a week about how crazy life can be. I’m also an aspiring author who dreams of standing next to my book in a Barns and Noble someday. If you want to know more about me and follow my journey, check out my blog Confessions of an Ex-Ballerina. What a perfect gift for a coffee lover. These are so cute! Love this! Thanks for the tutorial!!! 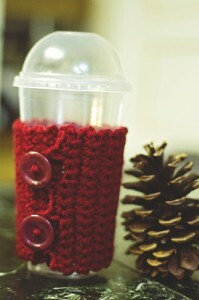 Will be making these this year for gifts!!! I cannot wait to make some of these. I plan on putting them on a nice Christmas mug & putting packaged cocoa or coffee or tea bags in them in a cute basket with some homemade goodies for a few dear friends. Thank you & Merry Christmas!